The Oshkosh Police Department is both a nationally and state accredited police agency. 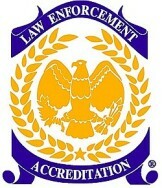 We are accredited through the Commission on Accreditation for Law Enforcement Agencies (CALEA) and the Wisconsin Law Enforcement Accreditation Group (WILEAG). 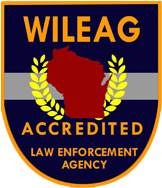 In Wisconsin, there are currently only 2 police agencies that have earned CALEA accreditation and only 30 police agencies that have earned WILEAG accreditation. Accredited police agencies show compliance to approximately 484 standards of professional police practices and represent the best in police services. The standards address six major law enforcement subjects, including: (1) Role, responsibilities and relationships with other agencies; (2) Organization, management and administration; (3) Personnel administration; (4) Law Enforcement operations, operational support and traffic law enforcement; (5) Prisoner and court related services; and (6) Auxiliary and technical services. 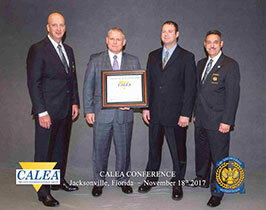 CALEA accreditation is valid for a period of four years. The Oshkosh Police Department earned its initial accreditation status in November 1994. Our seventh re-accreditation was awarded in November 2017. We are one of only approximately 600 police agencies in the United States, Canada, and Mexico to be a CALEA accredited law enforcement agency. Accreditation is a coveted award that symbolizes professionalism, excellence and competence. The community and police department can take pride in their department, knowing it represents the very best in law enforcement. Accreditation embodies the precepts of community-oriented policing. It creates a forum in which police and citizens work together to prevent and control crime. This partnership helps citizens understand the challenges confronting law enforcement, and gives law enforcement clear direction about community expectations. Accreditation standards give the Chief Executive Officer a proven management system of written directives, sound training, clearly defined lines of authority and routine reports that support decision making and resource allocation. Accredited agencies are better able to defend themselves against lawsuits and citizen complaints. Many agencies report a decline in legal actions against them once they become accredited. Accreditation provides objective evidence of an agency's commitment to excellence in leadership, resource management and service delivery. Thus, government officials are more confident in the agency's ability to operate efficiently and meet community needs. Accredited status may make it easier for agencies to purchase police liability insurance; may allow agencies to increase the limit of their insurance coverage more easily; and, in many cases, may result in lower premiums.